Reduced graphene oxide (RGO)/Ni composites with high-performance microwave absorption were successfully synthesized through the electroless plating. The structures and morphologies of the materials were characterized by X-ray diffraction, Raman spectroscopy, X-ray photoelectron spectroscopy as well as scanning electron microscope. Results show that spherical pure nickel particles are uniformly distributed on the surface of RGO. The complex permittivity and permeability of the composite were measured by mixing RGO/Ni with paraffin, the minimum reflection loss could reach − 51.1 dB, and from 7.28 to 11.28 GHz, the reflection loss is less than − 10 dB. 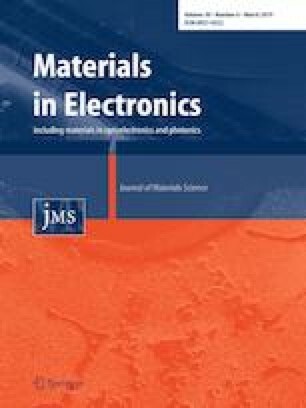 Through the analysis of the absorbing mechanisms, it is found that the quarter wavelength theory contributes more to the absorbing performance than the impedance matching. In addition, changing the electroless plating time is a feasible method to adjust the absorbing properties of the materials. RGO/Ni is an excellent microwave absorption material with a strong tunable absorbing property at its own low content. The authors acknowledge the financial support from the Shanxi Province 1331 Project Key Innovation Team of Polymeric Functional New Materials and the Shanxi Province Innovative Disciplinary Group of New Materials Industry.